Svaneti region is not that “oh wow, it’s so far!” anymore. The regular flights (6 times a week from Tbilisi, 2 times a week from Kutaisi) made it closer, and the road from Zugdidi to Mestia is not that scary, as it used to be before its renovation. I went there in December to see the preparations to the winter season which usually lasts till the end of April, even though in 2017, several fantastically crazy people have skied on Tetnuldi mountain on the 10th of June. 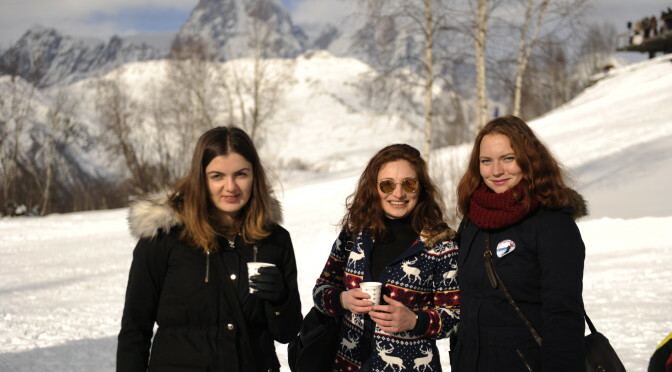 Wanted to tell you more about the winter holidays in Svaneti. I am not a skier yet, but I’ve been there, rode all the lifts, lived in different hotels and traveled with different vehicles. Would be happy to help you planning you trip! A flight with Vanilla Sky to Mestia resembles to a ride with an ultrasonic marshrutka – not because the driver wants to die and take you to hell with him, but because the plane is tiny. Think about it, when you will consider going to Mestia: it’s quite hard to get at least one ticket. The price of Mestia – Tbilisi/Natakhtari flight is 65 lari. It is scheduled every day except Saturday. The transfer from Tbilisi to Natakhtari airport is included into the ticket price. The flight between Kutaisi and Mestia is scheduled on Mondays and Fridays and costs 45 lari. You cover the distance between the regions in 50 minutes. With the car, it would be 9-10 hours. With a train and a car – also around 10-11 hours (train to Zugdidi, than a minibus or a taxi up to Mestia/Becho/Latali). From above, you see not only Svan villages around Mestia, but also the highest village in Europe, Ushguli, the epic Caucasus (Greater and Lesser, see the difference at the third picture) crowned by Ushba, Shkhara and Kazbegi peaks. The information about the train and bus to Svaneti and all around Georgia are in this article. The amount of accommodation units in Svaneti is growing and multiplying. Now every second family has a guesthouse or a homestay, while 5 years ago finding a decent bed and breakfast was challenging. – Homestay “Zhareda” in Ushguli of Zaur and Marekhi Nizharadze. – Grand Hotel Ushba in Mestia (they have heating and electricity, even when the whole village has no). Those are simple, warm places for simple people. – Hotel Tetnuldi – its most pretty part is common room/bar with the fireplace. Though, once I stayed there in December 2014, they had problems with heating. – ბანგურიანი მესტიაში • Banguriani in Mestia – my recent photos are from there. It consists of several two-storey cottages – all rooms are comfy, but the bathrooms are colder than the living space, I should confess. The khachapuri I ate there for breakfast was one of the best in my life. Banguriani also has an on-site restaurant with decent prices, and I liked their food. I hope to discover more, but usually after I stay somewhere once and become friends with the owners, I keep coming back. This is a very Georgian thing. – 3 rides pass – 15 lari, daily ski pass: 40 lari, weekly pass – 232 lari. This time I won’t help you that much: the choice in Svaneti is getting better, but still it is all very obvious. Everyone goes to Laila at Seti Square in Mestia at least once – the most central place that has decent traditional menu. Mostly the food spots call themselves “café” at the Google maps, but don’t be deluded: it’s rather restaurants that serve homemade Georgian food. Nothing too fancy. I think every Svan will insist that you taste kubdari, the meat pie that is originally from Svaneti. If you eat meat, go for it! If not, I should say that khachapuri with local sulguni cheese, chvishtari (cornbread with cheese) or even simple Svanetian potato with greens and Svanetian salt can taste well (especially after the day outdoors). If you want the best coffee in the whole mountainous areas of Georgia, stand with your face to the little park at Seti, turn right and walk around the corner to find a fabulous coffeeshop called Erti Kava. Opened by well-Georgianized non-Georgians, it has a huge menu that has not only “normal” coffee, but also aeropress and seasonal delights like cocoa with marshmallows, coffee with spices, grogs and mulled wine. If you follow the main street, you will be surprised by the café that serves desserts (Rea Dessert Café) – I couldn’t imagine such things four years ago, as I got to Mestia for the first time. Nearby, there is also a bar called Buba that gathers a lot of younger locals and all kinds of travelers. A visit to one of the highest restaurants of Georgia on Zuruldi Mount is inevitable, if you go up to Hatsvali ski resort. But even if you don’t ski, THAT panorama and hot kubdari with tea or mulled wine will be the proper thing. If you stay not in Mestia, but in Latali community, all your road will lead to Ksenia Parjiani, who has brought modernity to the local lifestyle. What to do in Mestia/Svaneti in winter besides skiing, getting crazy about the views and eating kubdari? That deserves a separate article. Stay tuned!